Any tiny diva will look amazing in this cutie patootie BLINGED out denim vest (no sleeves). Choose from white denim, light denim or dark denim. 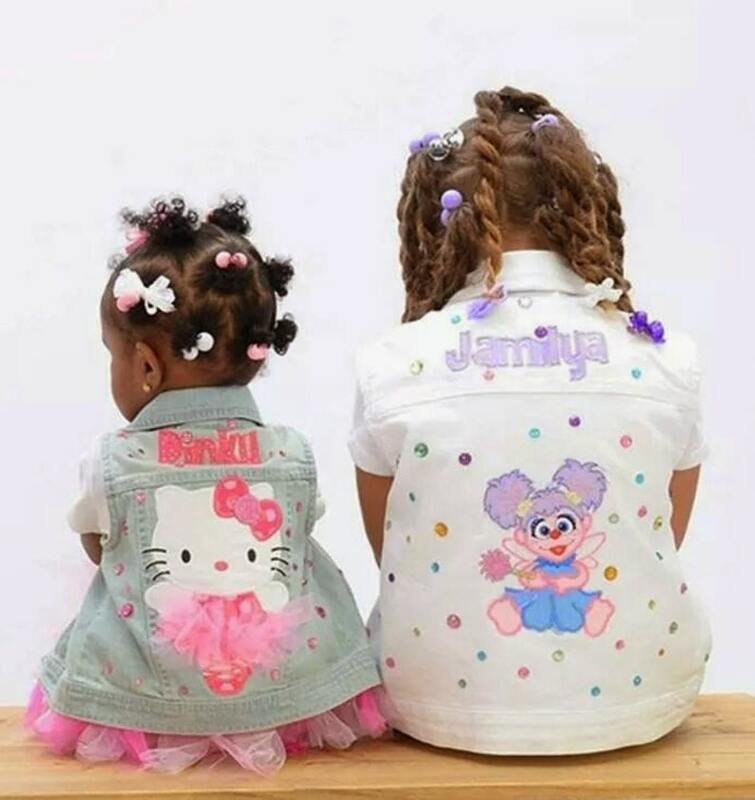 Each vest is customized with your child’s name and favorite character, then it is sparkled to perfection with matching rhinestones. Please see link below to purchase additional characters. Be sure to note name of character in the comments section at check out. Each vestis custom made. The custom process takes about 3 weeks. Quality construction and bright colors make this vest perfect for party time, pictures or just everyday cuteness! Everything made by Remitha Lynn & company is made with love and has a full guarantee. My Daughter and I absolutely love her Birthday Barbie Denim vest!!! It is beautifully made and the attention to detail is impeccable!! I would totally recommend purchasing from this shop!!! I wish I was savvy enough to take a photo to post online for you to see the actual jackets I had made for my grandkids. But I am not. So you'll have to take my word for it. She made a Minnie Mouse jacket for my 4 year old granddaughter that is absolutely the cutest thing I ever saw! Bows and sparkles and extra adornments, and a matching hairbow to boot! With a huge pink Minnie on the back! My 2 year old grandson got his favorite Elmo character on his jacket with added Sesame Street characters. And she puts their names on the upper back in beautiful colors and patchwork. These kids are gonna be the talk of Disney World (not to mention preschool) every time they wear them! Note: Go up at least one size. And even more if you want your child to be able to wear it while growing. This lady has so much talent and ingenuity.